Buddha To Buddha Pendant Sitting Buddha XS + Silver Chain 18"
Express the symbolic meaning of the Sitting Buddha with this beautiful 925 sterling silver pendant necklace from Buddha to Buddha. The pendant also comes with a Sterling Silver one size-fits-all chain to hang your pendant around your neck. 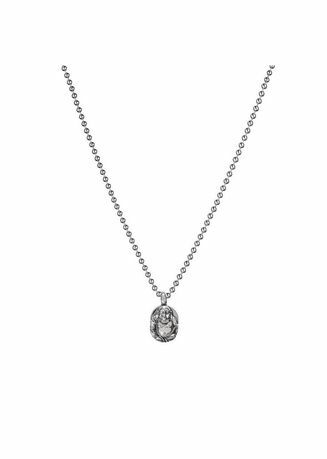 The silver jewelry features the signature Buddha to Buddha logo to ensure authenticity. Handmade, certified 925 Sterling Silver. Length of Chain app. 18 in"., width of pendant app. .37 in" (9.5mm).